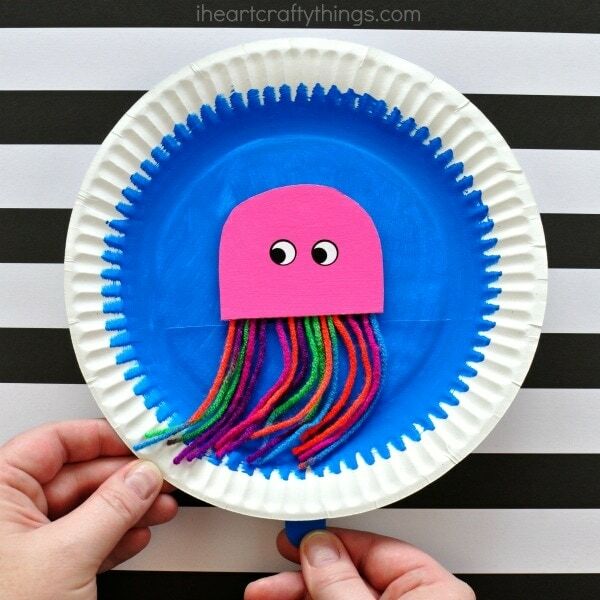 We combined our love for paper plate crafts and ocean animals to create this darling swimming jellyfish craft that will have your kids screaming with delight! 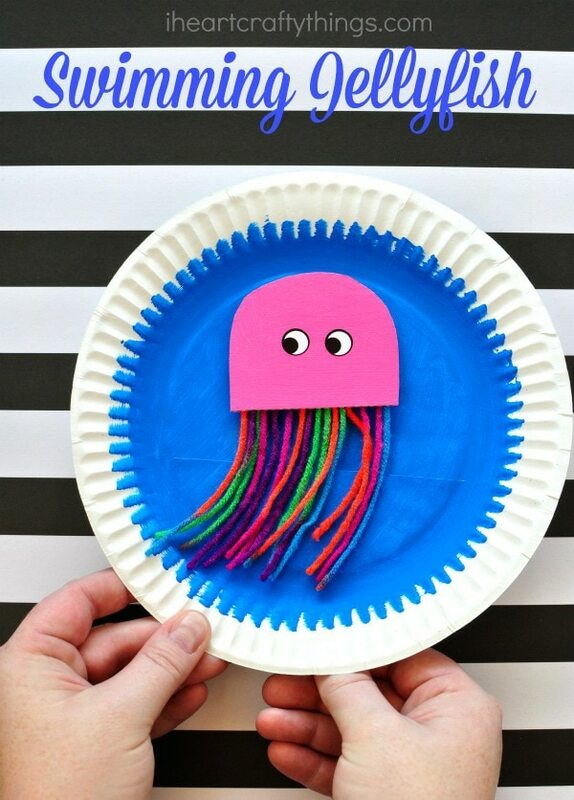 I’m a big fan of crafts that children get to interact with after making them and this fun jellyfish craft is just that! 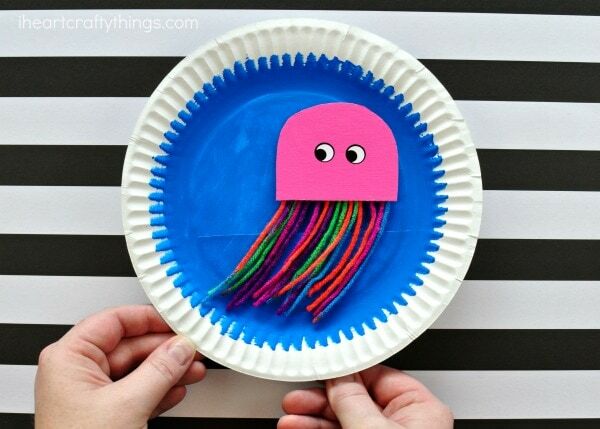 Kids move the craft stick behind the paper plate and watch as their colorful jellyfish swims around and around on the paper plate. So much fun, huh?! 1. Gather your materials. 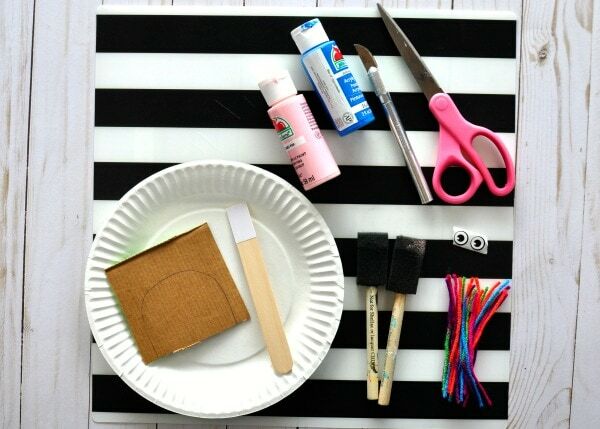 Draw the shape of a jellyfish body on your small piece of cardboard and cut it out. Paint the piece with your pink paint, or whatever color you want your jellyfish to be. Set it aside to dry. 3. 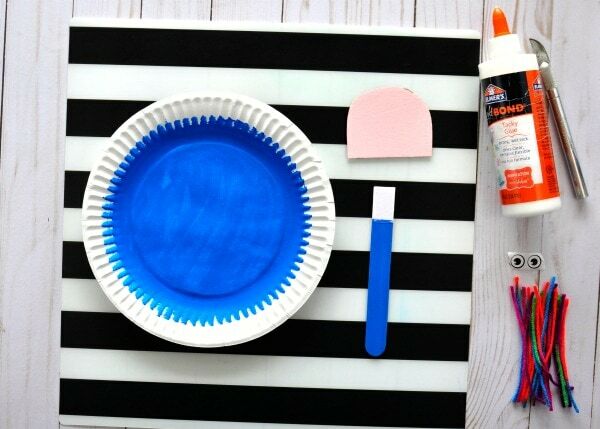 When your paper plate is dry, have an adult use a craft knife to cut a slit in the paper plate about 2/3 down the plate. This is the slit for your jellyfish. 4. Turn your jellyfish body over and add a line of tacky glue at the bottom. Cut several strands of colorful yarn and place them down on the tacky glue. These are your jellyfish tentacles. Turn your swimming jellyfish craft over and place two googly eye stickers on it. Let the jellyfish craft dry completely before playing with it. 5. To make your jellyfish swim, place the craft down inside the slit in your paper plate. Hold the stick from behind the paper plate with one hand while stabilizing the paper plate with your other hand. When you move around the craft stick behind the paper plate your jellyfish swims around and around. Fun, right?! My friend Helen has another fun way to use this swimming technique by making a paper plate goldfish bowl. 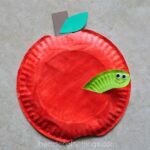 Try making several different ocean animals to swim around in your ocean scene! Looking for more ocean crafts to make this summer? You’ll love these 15 Ocean Crafts for Kids! Or here’s a simple way to turn an egg carton into an adorable whale craft. Love your crafts. I teach 3 k. Always need crafts! Thanks for all these cute crafts. I love the father’s day owl. We are making it for our father’s. Hi Rachel. 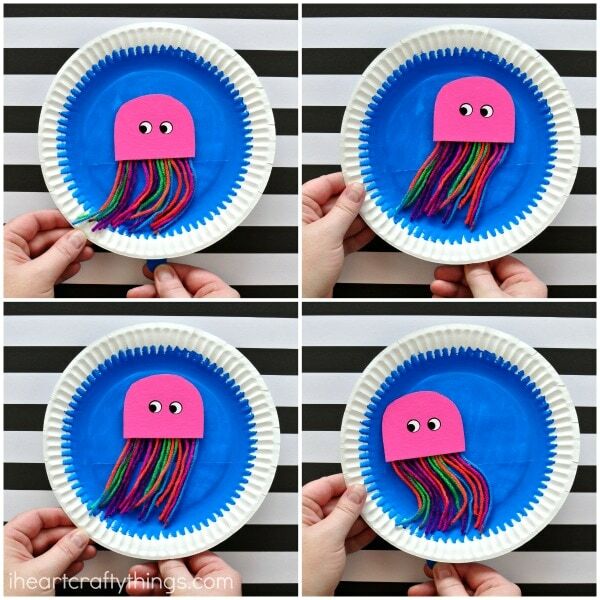 Love this dancing jellyfish craft! First saw this on your instruction youtube video. 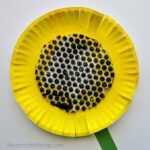 Hope you will try making my easy paper plate tire swing craft with your little ones. 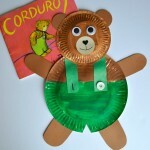 Download the free instructions at http://www.skippingstonepress.net/easy-paper-plate-tire-swing-craft/. Very very cut !! I love it ! !